Let us pretend that I’m not completely running out of ideas for these intro photo badges. I mean, you HAVE to try this recipe. It’s postively . . . celestial. Okay, moving right along. Prior to a couple of years ago, most of my exposure to Thai food was limited to curries and noodle dishes. One day we were dead tired after work and looking for something to order outside of the typical Chinese or pizza. 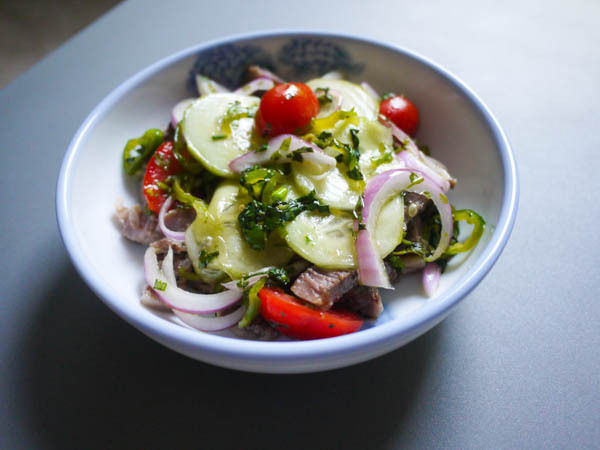 We found a Thai place that delivered and ordered a few meaty sounding salads, including a version of this called yum nua. Since that time, I’ve seen this made several different ways, with all kinds of ingredients. 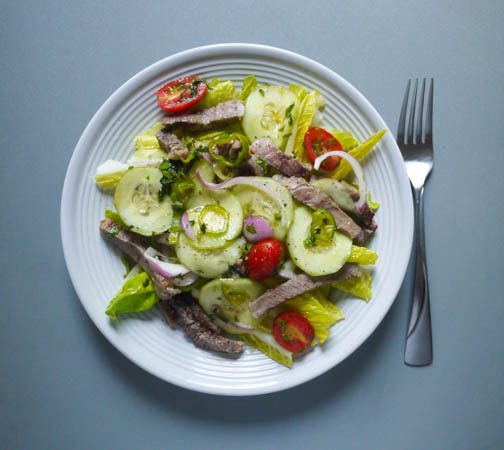 I’ve experimented with making it with heavier dressings and different cuts of steak, but this version is our favorite and super easy to make. It’s adapted from a recipe in Cook’s Illustrated Best 30 Minute Recipes to fit our tastes. 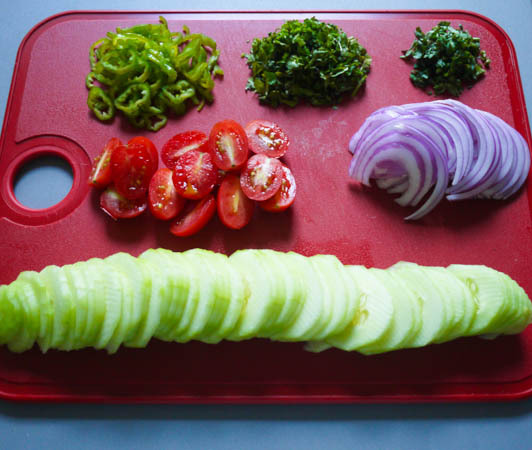 Slice your onion, cubanelle pepper, tomatoes, cucumber, cilantro, and basil. 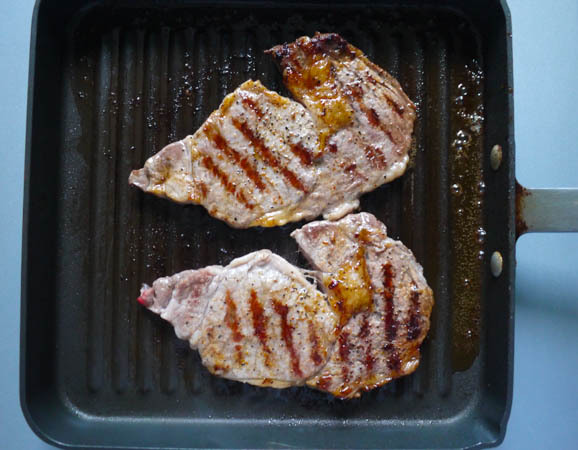 Heat a grill pan on medium high heat and spray with a light coating of nonstick spray. Season your steaks with a little salt and pepper on each side. 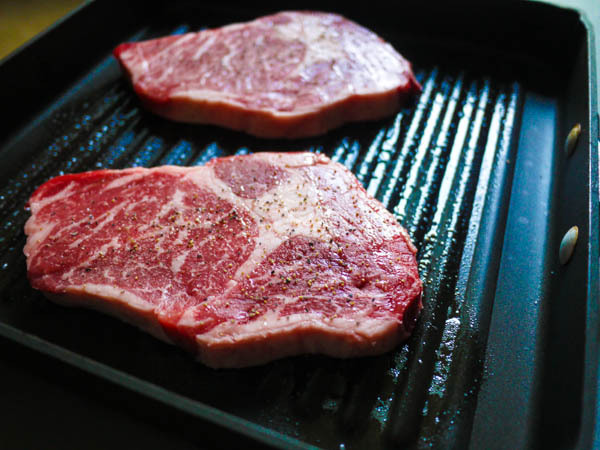 Remove steaks from pan and let rest on a plate for 10 minutes. 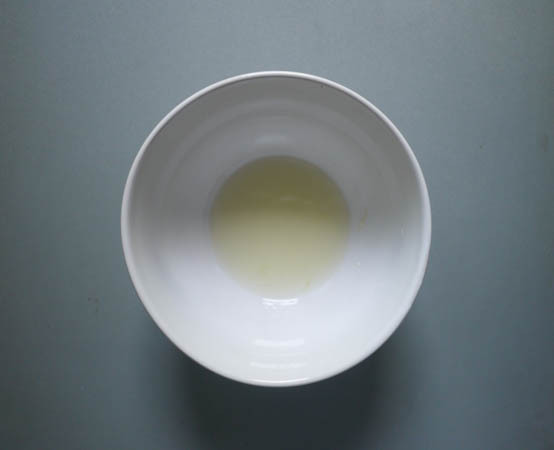 Divide this lime juice mixture between two bowls. 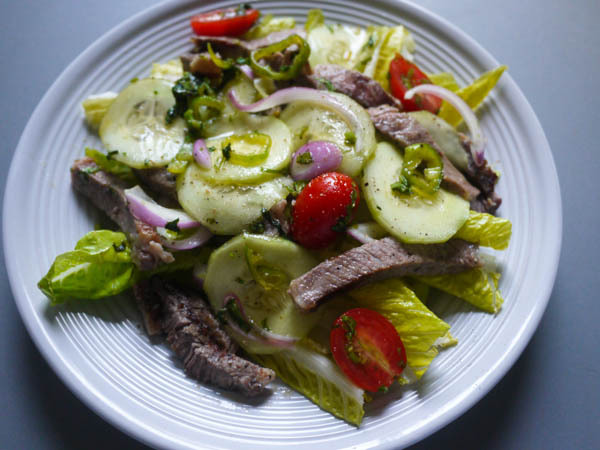 Thinly slice your steak and add it to one of the bowls with the lime mixture. 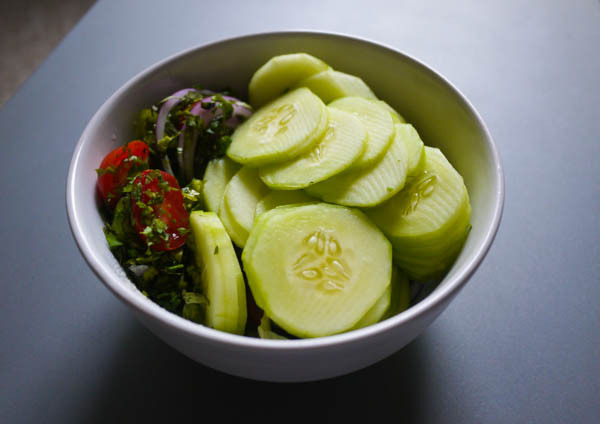 Toss your sliced veggies and herbs into the other bowl with the lime mixture. Add 1 tablespoon of olive oil to the bowl with the veggies and herbs. 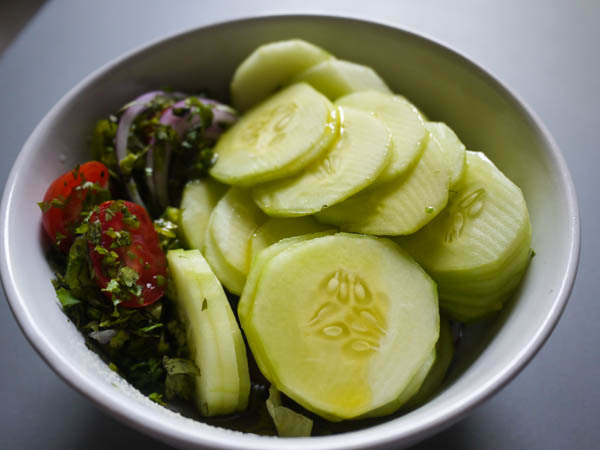 Use your hands to vigorously mix the ingredients together so the flavors start to meld. 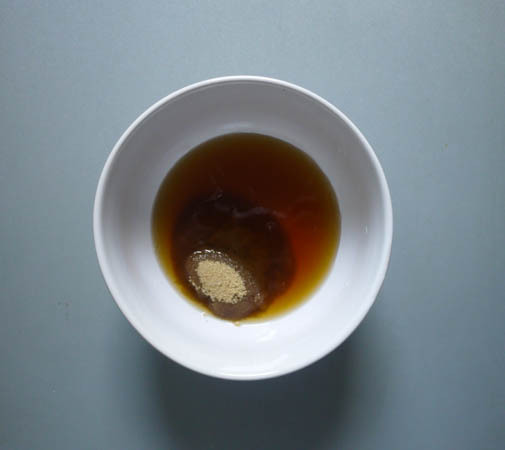 Let both components marinate in their respective lime mixtures for at least 10 minutes. 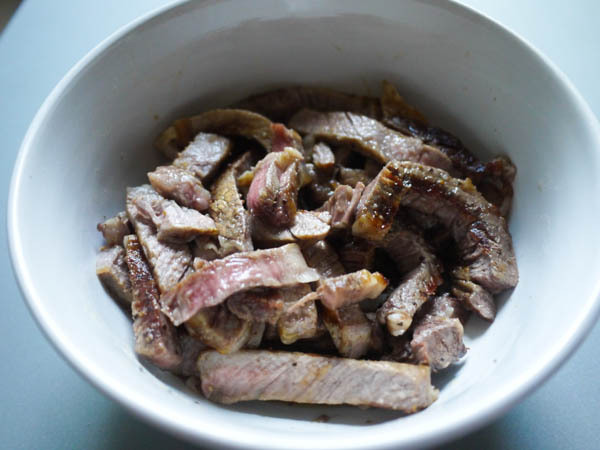 Remove steak from lime mixture and discard the marinade. 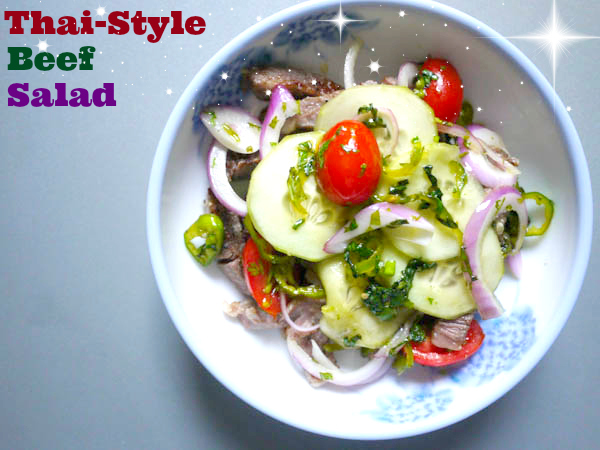 Remove veggies from lime mixture and discard the marinade. You can serve this as is, with steak on the bottom and seasoned veggies on top. Or you can serve both on top of torn romaine lettuce. There’s no need to add any dressing because the meat and the vegetables will have sucked up and still be coated with the delicious marinade. 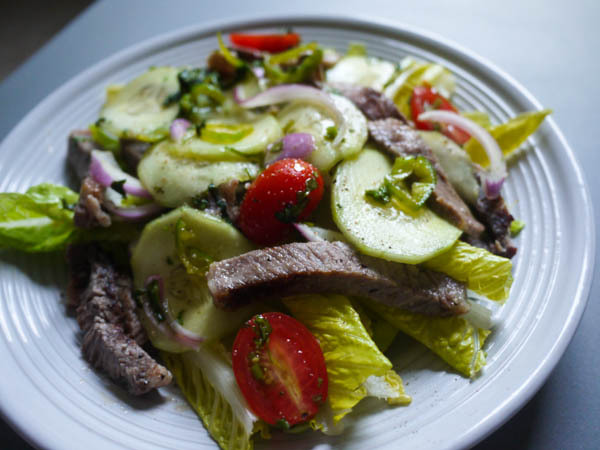 Thai-inspired steak salad with fresh cucumbers, tomatoes, herbs, and peppers steeped in a light and crisp marinade. 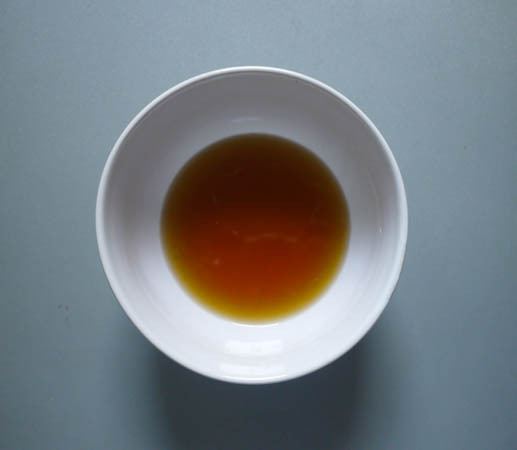 In a small bowl, mix lime juice, fish sauce, and brown sugar. 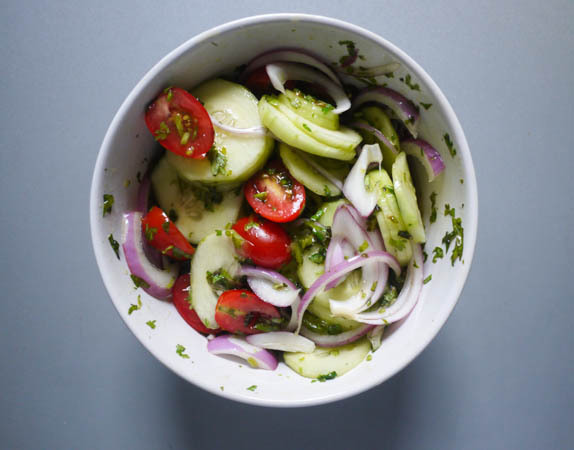 Add 1 tablespoon of olive oil to this bowl with the veggies and herbs. Or you can serve both on top of torn romaine lettuce. Nutrition information provided includes the lime marinade, even though it is not consumed in the final dish.